In 2011, the CIW launched the Fair Food Program (FFP), a new model for Worker-driven Social Responsibility (WSR) based on a partnership among farmworkers, Florida tomato growers, and 13 participating retail buyers, including Subway, McDonald's, Burger King, Chipotle Compass International, Whole Foods and Walmart. With the Fair Food Program firmly in place and the partner base growing, it was time to involve consumers to raise awareness and spur action. The FFP approached P&P to create an identifying label. Inspired by their mission, we immediately envisioned so much more than just a label. FFP's message promoted with the right branding had unlimited potential. Branded correctly, we recognized that the FFP could become ubiquitous - consumers everywhere, across all media would learn of the mission and get inspired to participate. Branding and Design: We created the identifying label and other collateral materials for the FFP to distribute to partner sites including Whole Foods, Stop & Shop and Compass International. The branding poster has become inextricably linked with the message and has been viewed at several major events. It provided the backdrop for Eva Longoria’s appearance on The Colbert Report, anchoring their discussion of the documentary that she executive produced, Food Chains. The Fair Food Program identifying label and logo, as well as the branding poster, have been viewed across all media, including talk shows, global award ceremonies, as well as local and national news coverage. 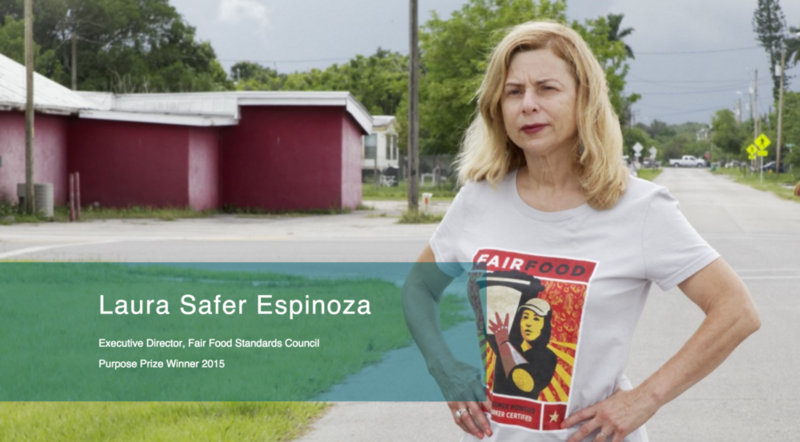 The Fair Food Standard Council's Judge Laura Safir Espinoza, honored with Encore.com's prestigious 2015 Purpose Prize. This ad was created for Stop & Shop's Savory Magazine which reaches over 13 million people. Raising awareness for the Fair Food Program in Stop & Shop supermarkets across the country. Whole Foods is the first FFP partner to launch an in-store campaign. The FFP is incorporated into Whole Foods’ “Responsibly Grown” initiative. We worked closely with the Whole Foods team to create branding and signage, which is currently in stores throughout the Southeast. Compass Group has been an FFP partner since 2009 and is the largest contract food service company in the world, serving over 4 billion meals a year in locations ranging from university campuses to museums and hospitals. We worked closely with the marketing team at Compass Group to create a POS awareness campaign. P&P, in partnership with the Food Chains documentary team, maximized visibility for the national launch of the new branding and design work on Food Day in 2014 through a variety of social media channels. We produced this video to raise awareness about the Fair Food Program. The video explores FFP’s history, mission and progress to date. It is being viewed across partner websites, social media channels and fundraising events. The video continues to inspire and garner consistently positive feedback.